Can’t stop laughing, can you? We couldn’t either. 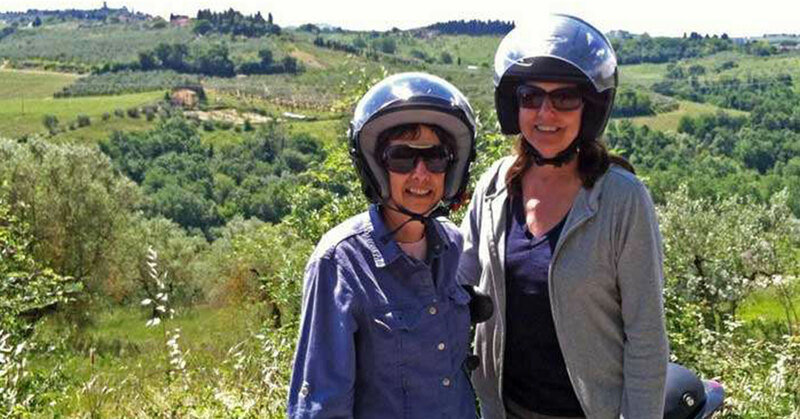 My sister and I had decided to ride Vespas in the countryside outside Florence. So we met up with the group, distinguishing ourselves by being at least a generation older than everyone else, as well as the only ones who hadn’t ridden anything vaguely like a motorcycle or tractor. Were we deterred? Not one bit. And then when we got these astronaut helmets that weighed more than a filing cabinet, we couldn’t look at each other without getting hysterical. Besides, it’s hard to give off cool biker-girl vibes when you look like this and your Vespa has a cartoon character on the front. The laughs lasted until after lunch – with wine, of course — when we were warming up in the parking lot for the afternoon ride. It was hard to go much faster than a crawl in the crowded lot, but I managed to hit the gas inadvertently and do a spectacular sliding crash into a brick wall. The crash, blood and torn clothing reduced my biker cred to zero. Was the day ruined? Oh, no, no, no. I lost my Vespa privileges but drew the envy of all other women on the ride by being required to sit on the back of our leader’s Vespa. Our young, hunky Italian leader, that is. Holding on to him. Very, very tightly. And still laughing.